Yes, those are the lyrics from the chorus of Luke Bryan’s latest hit single. Also, pretty much the theme to our recent Summer weekends. We’ve been all about having good times, making great memories with friends, and embracing the heat while making sure there’s a readily available swimmin’ hole somewhere in our family’s vicinity. Pretty much every weekend has included a night time bon fire. They probably will too, until it just gets too hot for it to be even reasonably safe, or enjoyable. So we make sure to keep several bags of campfire sized marshmallows stocked in the pantry. Not just for the kids either. Our adult friends enjoy a good roasted marshmallow just as much as they do! I don’t know how it came to be, but s’mores recipes and flavors have always been and continue to be a cornerstone of our Summers. It’s true, we can’t always be seated around the camp fire, making them ourselves. But melty marshmallows, savory milk chocolate, and graham cracker is a combination that’s synonymous with our warm days and many wonderful memories. Even when we can’t have the treat as it was originally conceived and intended, we still need our fix. Over the years we’ve found various ways to make that happen. 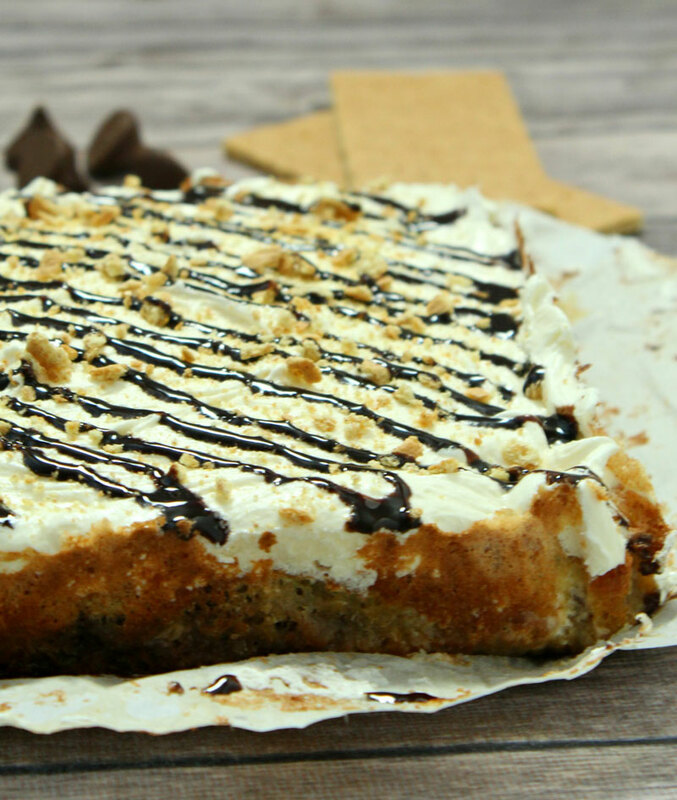 This S’mores Poke Cake being the latest example. It’s so good too, that I was in an all out rush to share it with you guys. This one can’t wait. It’s just begging to be rushed to the top of your ‘to-try’ list. 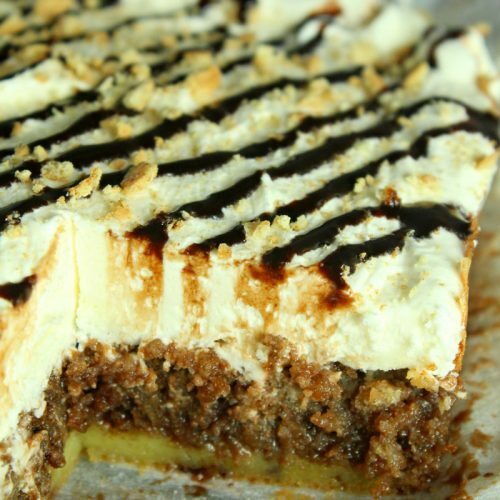 A yummy, moist cake- this otherwise traditional batter features ground graham cracker and chocolate syrup mixed right on in. So from the beginning, you’ve got the basis of your traditional ‘s’more’ not only included, but embraced! 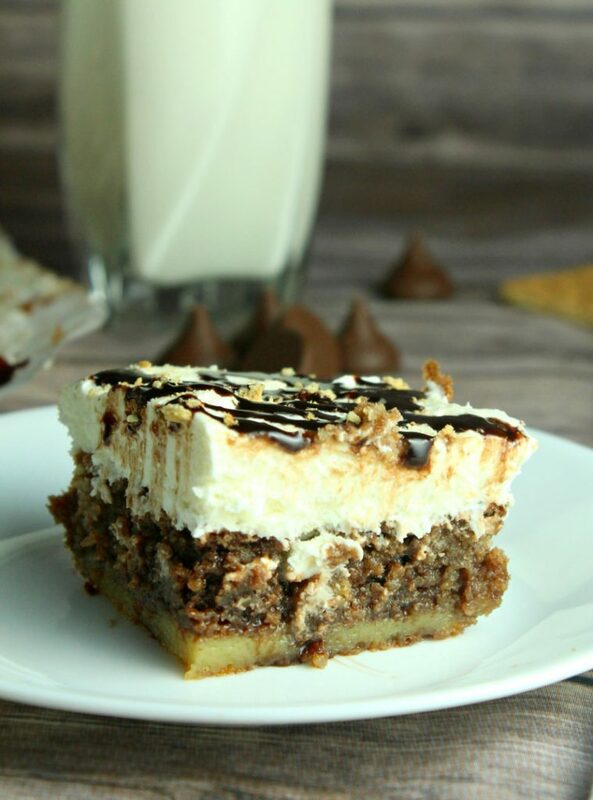 This sweet chocolate, graham cracker flavored cake is topped with a luscious, creamy marshmallow buttercream. 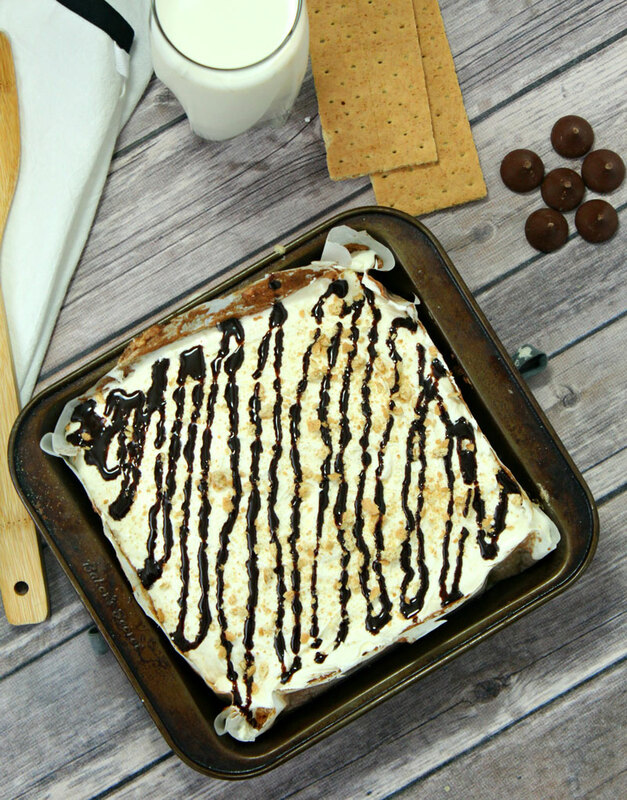 This otherwise traditional buttercream uses almond extract instead of the typical vanilla, and whips in marshmallow fluff before being spread smoothly over this amazing, super yummy S’mores Poke Cake. 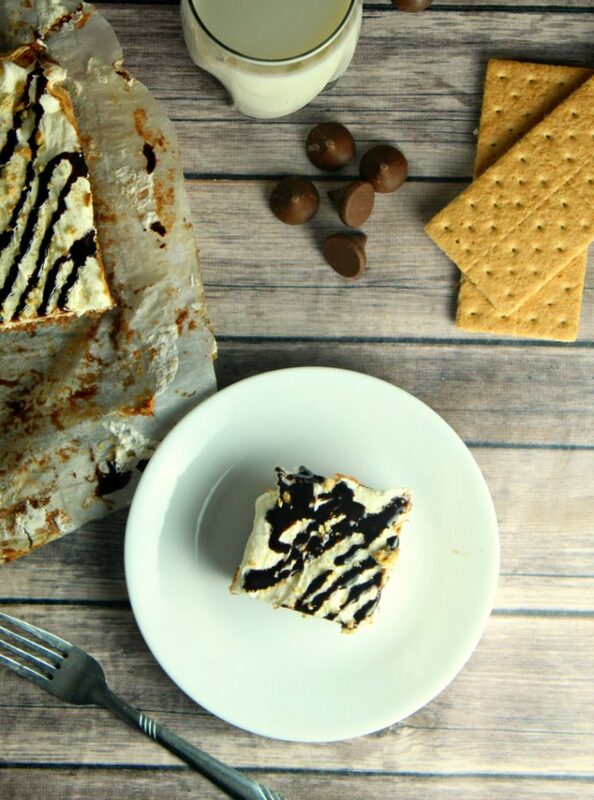 Other S’mores ideas you might also enjoy include this S’mores Ice Cream Pie & our quick and easy S’mores Dip. Preheat over to 350 degrees F. Line a 10"x8" cake pan with parchment paper. Combine 1 1/2 cups of the crumbled graham crackers, flour, baking powder and salt in a medium bowl to set aside. In a separate bowl, beat the softened butter until creamy. Add sugar, vanilla, egg yolks, milk, and flour mixture and mix until thoroughly combined. Beat egg whites with a hand mixer in a separate bowl until stiff peaks form and fold into the cake batter mixture a 1/3 cup at a time. Pour batter into prepared cake pan and bake until golden, 20-25 minutes. Set aside to cool. Beat butter until fluffy, mix in vanilla and confectioners sugar 1 cup at a time then add in the marshmallow fluff. 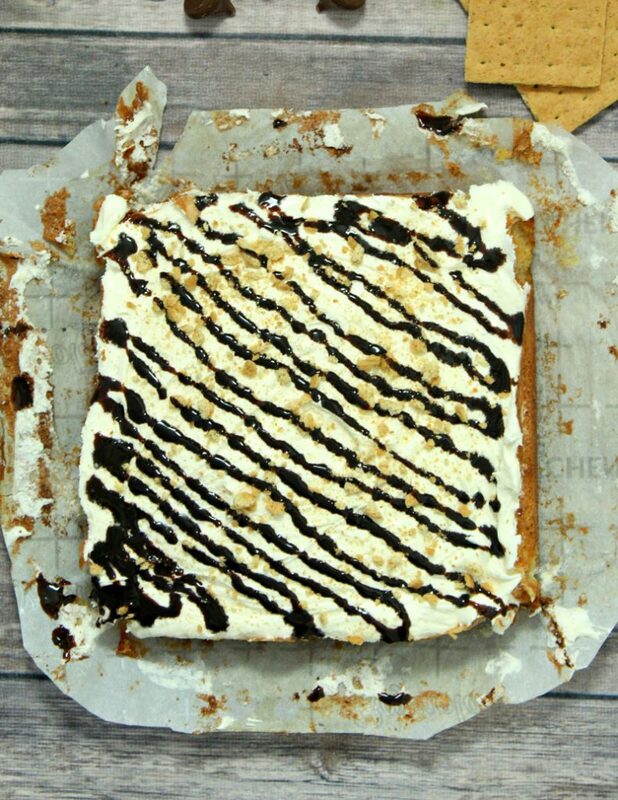 When the cake is cooled, poke holes with the back of a baking spoon all over the top of the cake, pour the chocolate syrup over the top and use a spatula to spread into the holes. 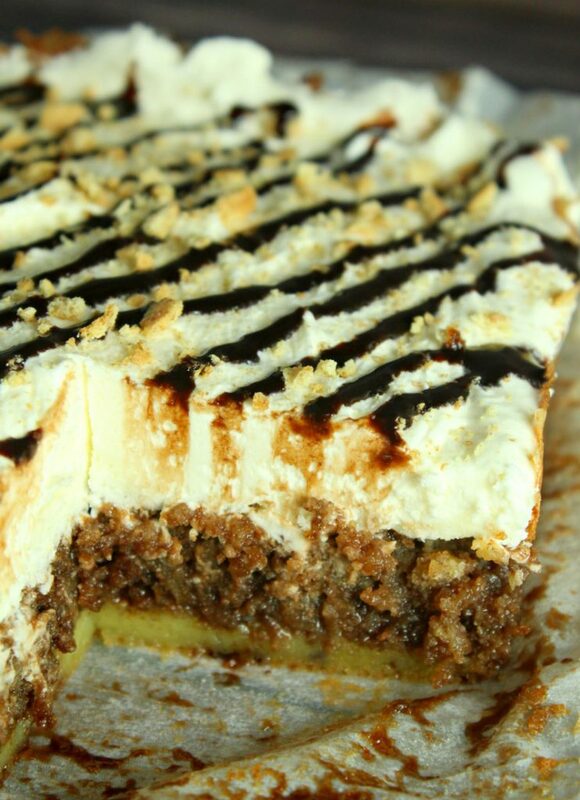 Top with frosting and sprinkle remaining crumbled graham crackers and drizzle with chocolate syrup. Serve immediately or store in the refrigerator. This sounds like something my boys would love! The marshmallow buttercream sounds great and I can imagine many uses for that too! Thanks for sharing at Fiesta Friday.